Claude Bosi’s two-Michelin starred Hibiscus has been on my to-do list for some time now since it made the move in 2007 away from its birthplace in Shropshire to its Central London location, tucked away at the corner of Maddox and Mill Street. Showered with accolades by the critics and bloggers alike, I’m not sure why its taken me this long to visit. Maybe its all this continued talk about a potential double-dip recession just round the corner which makes it just that little bit more difficult to dig into the pockets to splash out on haute cuisine. So, rather than take the full dive, the £48.50 five course dinner + bubbly top-table offer seemed the perfect test-driving opportunity. The simple, minimalist dining room, though surprisingly small, felt remarkably comfortable and private. Shortly after being seated, on came the bubbly (a lovely Pol Roger brut, fresh from a newly popped bottle) and some warm parmesan mini-bread rolls to accompany. The little rolls, though wonderfully airy and light were overly salty if you ask me. 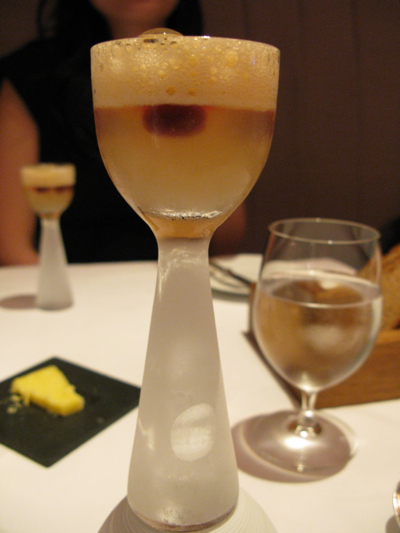 Then came the appetizer… an Apple and Carrot Spritzer spiked with berries of some sort. As I was zooming in with my camera for a macro shot of this playful amuse bouche, I was interrupted halfway by the Maitre D who was shaking his head in disapproval. Confused initially as I thought my camera was off limits, he then brought out an expresso cup as a pedestal for me to perch the tall spritzer glass on… “the angle is much better like this…. go on!” he said. The joker was right – it was a much better shot. Following the photography lesson, he then instructed us on the rules of the game “…take a little sip and then go for it…Down it! GANBATTE!” he urged. So ganbatte we did. What a great palate cleanser it turned out to be – fun, refreshing and detoxifying all at the same time. 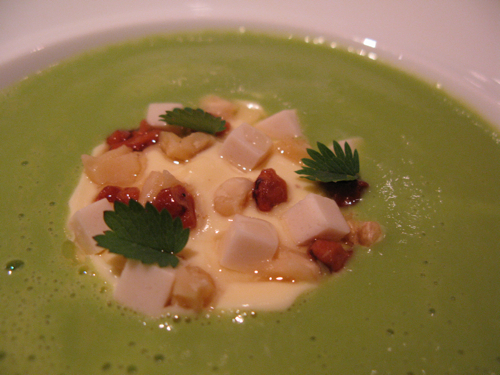 Onto the next course: an Asparagus Veloute with a warm Royale of Parmesan and Walnuts. The bold, punchy flavours of the Parmesan cream and Asparagus puree worked well together, as did the textural crunch from the walnuts. But I must say, after having my palate invigorated by the spritzer, I was more up for some real food which I could sink my teeth into… Foam, purees and churned up baby food at this stage just didn’t quite make it. 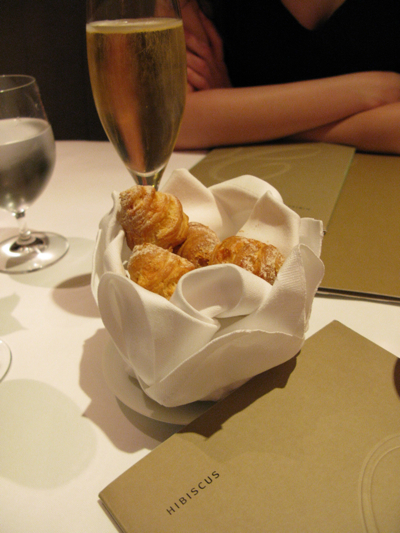 The two Michelin-star pedigree did eventually start to show when we got to the main courses. Bosi successfully showcases some complex yet classic flavours, cutting-edge originality and some seriously stunning plating in his dishes. 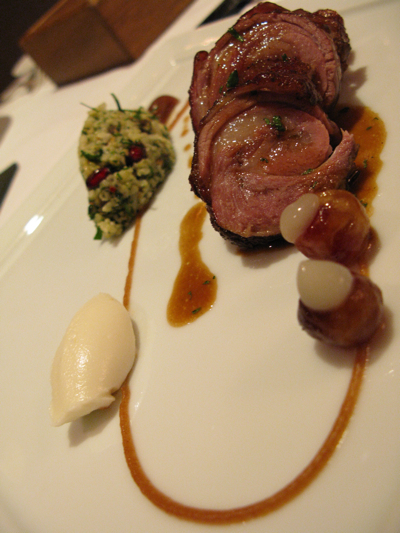 The Elwy valley Lamb belly I ordered was served with a Rose Petal Masala and a Medjool Date and Pomegranate Tabouleh. The fat streaks in the belly cut were bursting with carnivorous flavour while the punchy Rose Petal Masala and tabouleh were an ingenious deconstruction of core Moroccan flavours. Very satisfying. 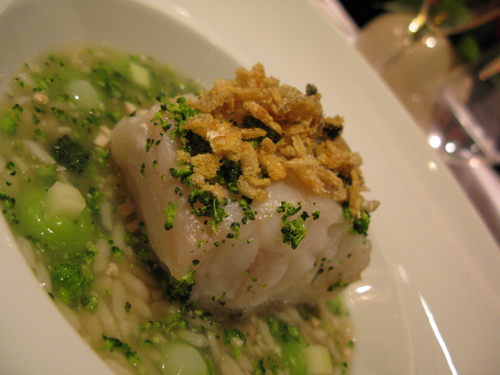 Jo opted for the fish course … Fillet of Ling from the coast of Cornwall, poached in a lemongrass, ginger and brocolli broth, with Bergamot lemon gel. A member of the cod family, Ling has a slightly firmer texture than cod (leaning towards monk-fish almost), but I find it a little blander in the taste stakes. However, Bosi uses the Ling as a blank canvas, constructing a nice suite of delicate and complex far-eastern flavours in the broth to accompany the fish. More of a soothing dish than one that blew our socks off. 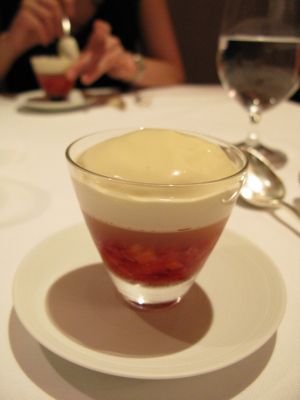 Then came the desserts: Pre-dessert first – Strawberry jelly topped off with a large dollop of Szechuan pepper cream. A nice take on Strawberries and cream, but I was expecting more from the Szechuan pepper cream which was a little too mild and tame. 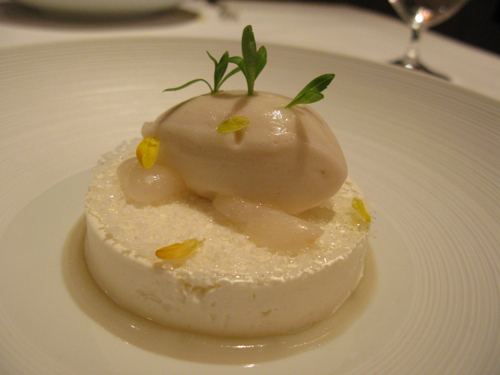 Finally, the main dessert: an air-light Coconut Parfait served with fresh lychee pieces and thick lychee puree, topped off by a scoop of Rose Water Sorbet. Neither a fan of Lychee, Coconut nor Rose Water, I was always going to be difficult to please on this one. On the whole though, the dish had a good balance of sweet, soothing flavours. The highlight was the many textural elements going on – the light crunch of the parfait, the fleshy lychee pieces and the cooling sorbet. Not something I’ll be craving for anytime soon though. With the test-drive complete, one question remains: Would I be willing to pay for the full £90 8 course tasting menu? Judging from the look of some of the dishes which a French couple beside us were oogling over from the degustation menu, we couldn’t help but feel they were the ones that were getting the real deal. On that basis, the piggy bank will likely be raided at some point in the future. p.s: Off to Prague and Budapest next week. Lotsa beer and meat-y posts to come… Have a lovely May Bank Holiday weekend.